In my ongoing effort to read all the books in my unread "pile" (more like "unread shelves"), I just read Rough House 3 which was published in 2015. I don't know how long I've had it--a good long while, I think. That said, they haven't published one since 2015 so now I'm all caught up. 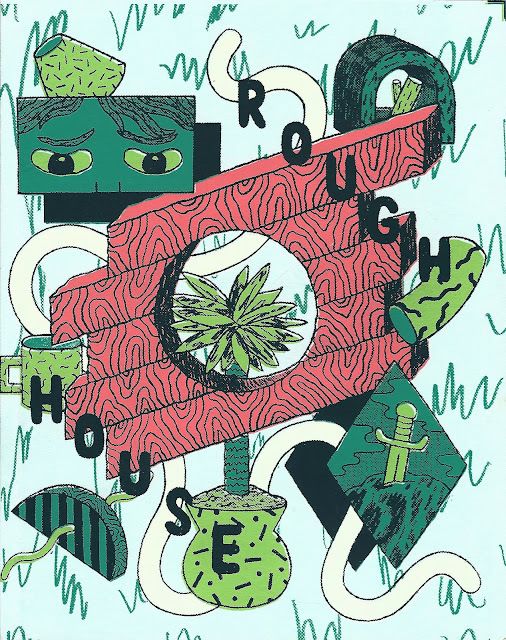 The idea behind Rough House has been to be an Austin-based anthology, but by volume 3, contributors come from all over--Dallas, Seattle, Chicago, New York, Tel Aviv, Croatia, etc. And it's the best volume yet--the drawing is varied and wonderful. 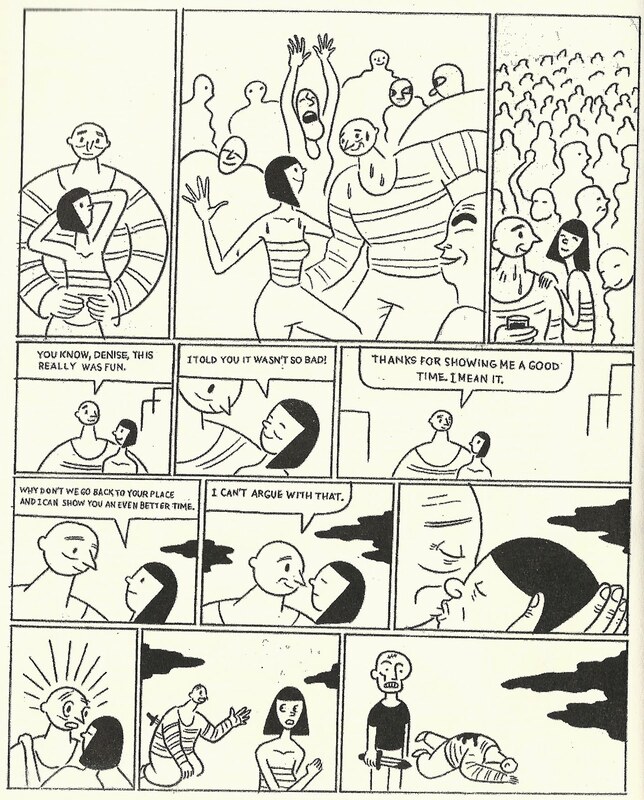 I love the drawing of Shawn Eisenach who contributed 4 mysterious silent one-page strips. Another artist whose visual style I liked very much was Lea Heinrich. 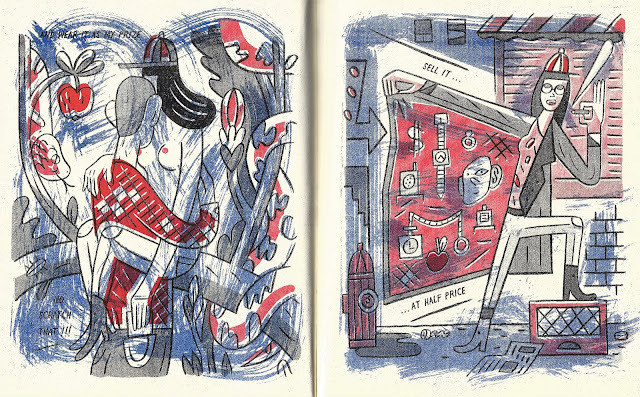 She had what I would call a very "Nobrow" style after the English publisher--a very designy illustrational style that seems extremely well-suited to the risograph. Her highly stylized drawing is layered with brushy blue tones. For her story "5 Finger Discount", she is adapting a poem by Lynn Gentry. Keren Katz's "The Man on Floor 319" is a little fable of the dangers of separating yourself from real life as well as the very real dangers of embracing life. It is drawn in black and white (not using the spot color capacities of the risograph printing) in a funny, clean cartoony style. 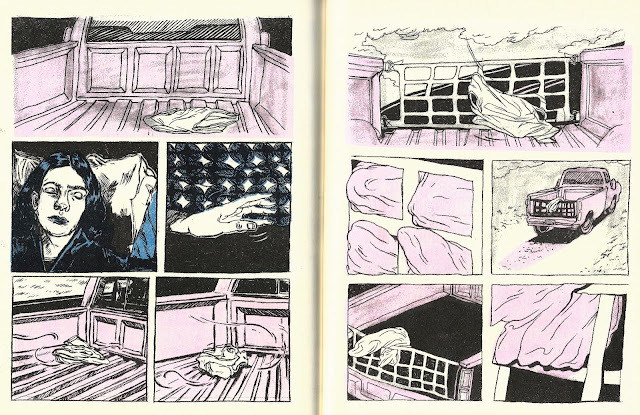 Sarah Welch's untitled wordless story switches between a sleeping woman (drawn in blue and black) and a truck driving through what appears to be a dry, West Texas landscape, depicted in black and an intense shade of pink. There's not really a story here--there's nothing obvious to connect the two parts, and nothing much happens. It's really just a sequence of evocative images forming the barest hint of a narrative. The book is printed on a risograph (with various spot colors) and is really well designed. However, the table of contents just lists the names of the artists and it is slightly confusing to figure out who did what story. Page numbers would have helped! 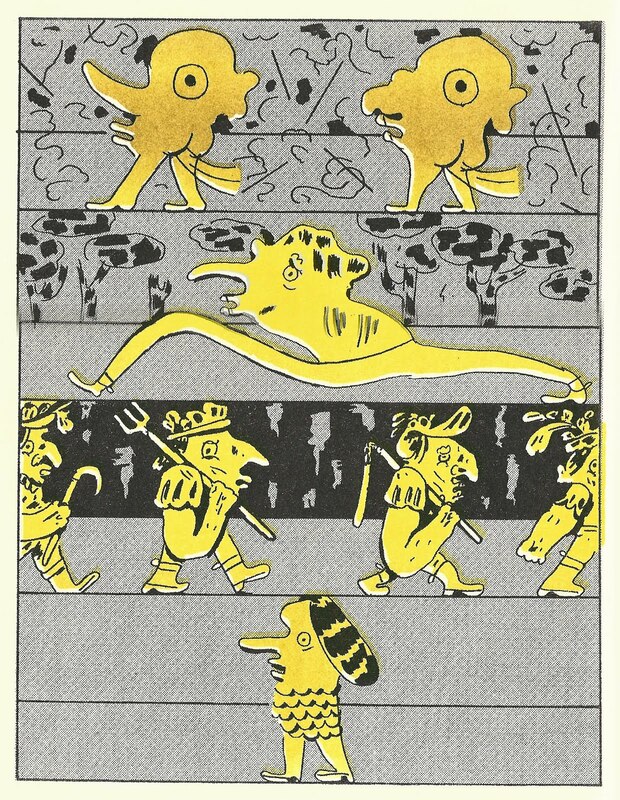 Yvan Alagbé published Les Nègres jaunes et autres créatures imaginaires in 2012, collecting stories that were originally published in Le Chéval sans tête, which Yvan Alagbé co-edited in the early 1990s. The longest story is Les Nègres jaune, which was originally published in 1994. 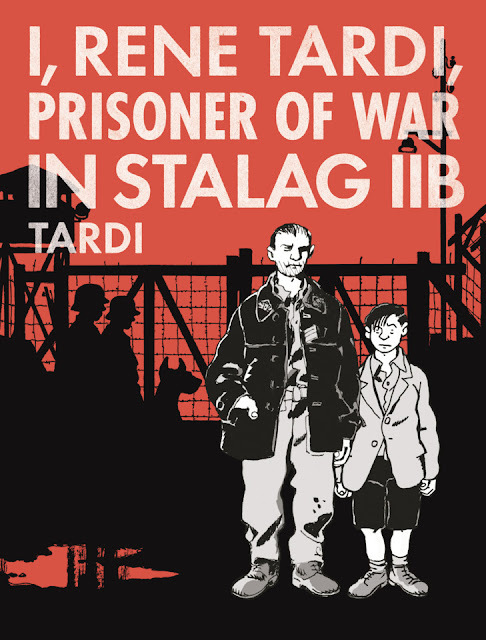 It is widely considered a modern classic of French comics. The New York Review of Books has in recent years been publishing comics, many translated from French and belonging to Alagbé's generation and general style--experimental, artistic and somewhat oblique.It's taken more than 20 years for the USA to catch up with this masterpiece, with New York Review Comics publishing Yellow Negroes and Other Imaginary Creatures in English with a new story as an afterward.These stories of migrants from third world countries seem more urgent than ever, although for Americans the situation is a little different. We didn't have, as France did, a vast African empire. Alagbé was born in Paris in 1971 of Beninese parents, and lived for three years as a child with his family in Benin. His stories are often about undocumented workers from Africa who end up in France. However, the stories don't exist to make a political point, even if such points are inherent in the stories. Alagbé is not a polemicist. His work is too subtle and inflected with modernism to be propaganda. At first glance, his drawing seems very sketchy. He likes to slather black ink on the page. He has an expressionist style. 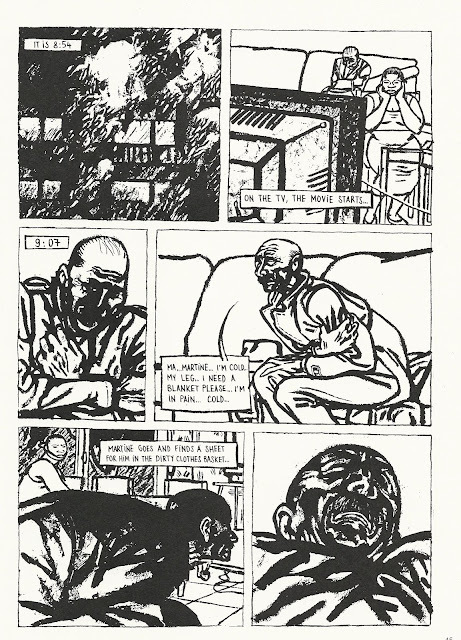 perhaps related to José Muñoz, an artist whose work he published through Amok, a boutique avant garde comics publisher in France. But he sometimes lays off the heavy blacks and uses fairly delicate line work or even a humorous, cartoony style. It all depends on the needs of the story at a particular place. This willingness to change the art to suit the story recall's Muñoz's teacher, Alberto Breccia. 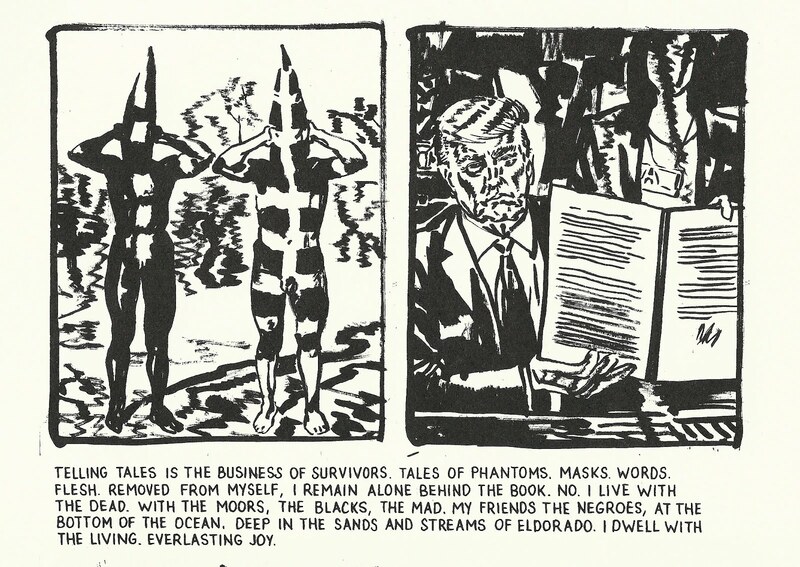 But Alagbé's drawing style is not what sets him apart--it's the structures of his stories. 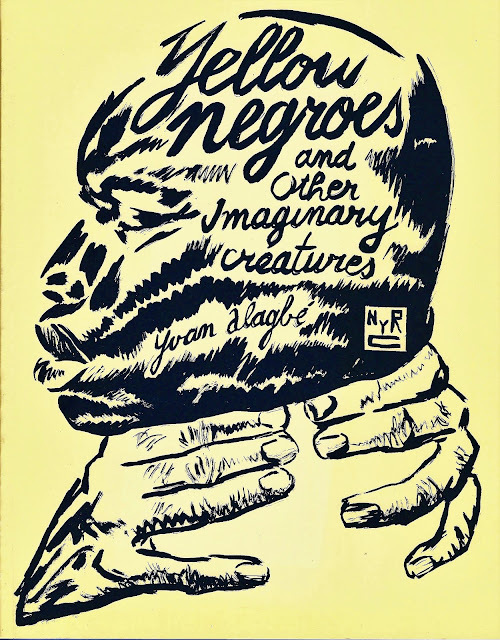 "Yellow Negroes" has the most conventional structure. The story of Alain, Claire and Mario--Alain is an undocumented Beninese man, Claire his white French girlfriend, and Mario, a former Algerian policeman who worked for the colonial government repressing the Algerian revolutionaries, making him a persona non grata in Algeria and an embarrassment to the current French police. Mario's awkward place between two worlds, neither of which want him, make him the most interesting character in the story. As an elderly retired policeman, he continually tells Alain and his sister Martine (who works as a housekeeper) that he can use his "connections" to help them get papers. But he is mainly a lonely man, who uses their abject state as a way to insinuate himself into their lives. But a totally different structure is used in "Postcard From Montreuil". 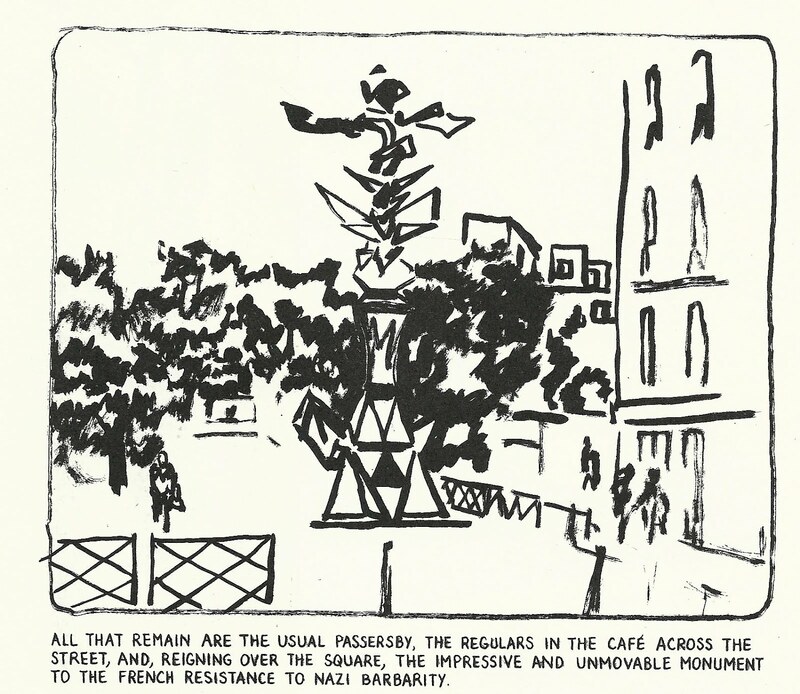 Here each panel shows a view of the street in Montreuil where the "Hommage à la Résistance 1939-1945" monument is. This abstract sculpture pops up in some of the panels, which otherwise mostly depict ordinary street scene--buildings, pedestrians, etc. Meanwhile, each panel has a caption below that describes how this was the site of a months long occupation of an employment agency by undocumented Malian workers. This jobs protest goes on for almost a year until the agency is moved without warning. It is not explained if the protest followed or not, nor are the protesters depicted in any way. Except for a few images of job notices pinned to a wall, almost every panel could indeed be a postcard of picturesque Montreuil and its "curious sculpture." Alagbé quotes the base of the monument: "If the echo of their voices weakens, we shall perish." The quote is attributed to Paul Éluard. In a way, the story itself shows that the echo of the voices of the protesters is weakened by the abrupt relocation of the jobs agency, but in a sense Alagbé's story itself becomes an echo, preventing the protest from perishing from memory. "The Suitcase" is a good example of how Alagbé changes his drawing style to fit the work. The barely there story is about Jeanne Martine Egbo returning from her "native land" to "France/Hollywood", carrying fish in her suitcase. 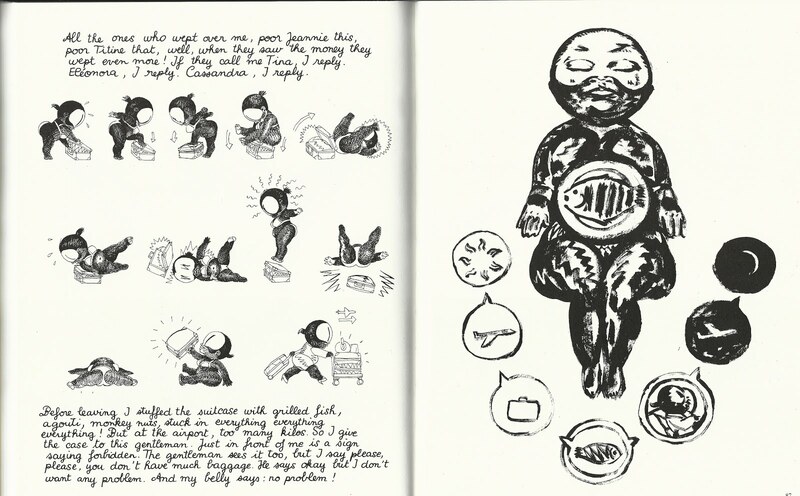 The style is very abstract and symbolic, except for a few images of Egbo dealing with her suitcase, which are depicted in a completely different, comedic manner. The new story "Sand Niggers" was drawn in 2017. Alagbé directly addresses the issue of "migrants" fleeing their homes to Europe, comparing their plight to another classic French comic from the 1990s (which I hope The New York Review translates)--Demonic Tales by Aristophane. The text is a meandering first person essay about migrants and refugees and survivors, as well as the dead. The images have an oblique relationship to the text. (Indeed, Donald Trump appears in one in one of his trademark signing ceremony poses.) "Sand Niggers" will perhaps help the American readership to make sense of what they just read. Jay Wehnert has been writing about outsider art, specifically Texas outsider art, since 2011 on his blog, Intuitive Eye. 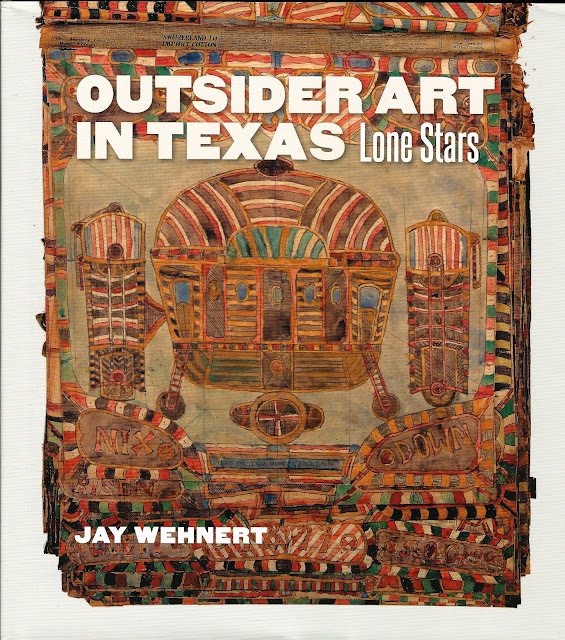 And now he has taken his research and put it together in one very handsome volume, Outsider Art in Texas: Lone Stars . He's not an academic, but the level of research here is impressive. In addition to learning what he could about each artist (and that varies with each one--in some cases, their biographies are well-documented, in others not so much), he bases a lot of what he writes on the ideas of Jean Debuffet and Roger Cardinal. Debuffet created the category with his essay "L'Art Brut préféré aux arts culturels" (1949) and Cardinal's book, Outsider Art (1973) which coined the term now in common use. But writing since 1973 has called the terms Art Brut and Outsider Art into question, although the basic ideas are still valid in my opinion. For me, the go to book on the subject is Everyday Genius: Self-Taught Art and the Culture of Authenticity by Gary Alan Fine, which I wrote about here. 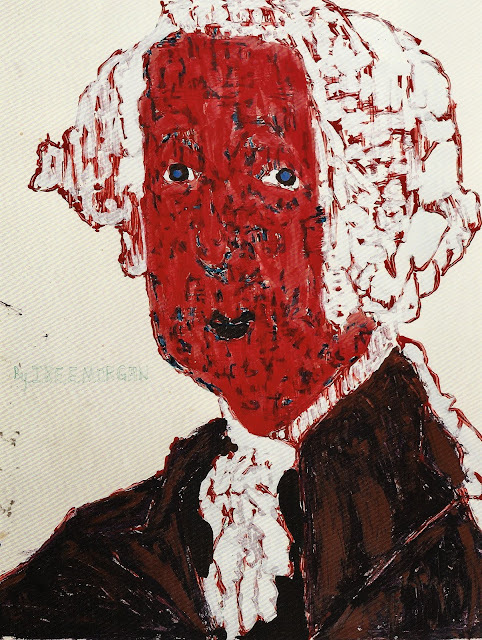 Fine was a sociologist so he was not just interested in the work of these artists and the artists themselves but the whole world in which the existed--the artists, but also the people interested in outsider art (collectors, scholars, etc.). Key to that world is how the work was "discovered"--how the work of an isolated artist not working within a particular folk tradition is found by someone who sees that this work is something that the art world might find interesting. The classic example of this was when photographer Nathan Lerner discovered Henry Darger's art in his apartment shortly after Darger's death. Lerner was sophisticated enough to realize that Darger's work was something special--one shudders to think what would have happened if Darger's landlord had been almost anyone else other than Lerner. Similar stories can be told for any number of great "outsider" artists. And these discovery stories become part of what Wehnert writes about. The complicated story of how the notebooks of Charles Dellschau (1830-1923) were discovered and preserved is a miracle of several people coming across his notebooks which were thrown out by his family in 1967. If any of these people hadn't stumbled across them, they might have been lost. But the stories of Ike Morgan, Felix "Fox" Harris and Vanzant Driver are more typical. In each case, one person discovered the art and brought it to the attention of the art world. Ike Morgan was locked away in a state mental hospital when he was 19 in 1977 after murdering is grandmother. He was diagnosed with chronic schizophrenia, and like many mental patients turned artist, drawing for him started as a form of therapy. In 1983, Jim Pirtle, a budding young artist, got a job as an orderly at the Austin State Hospital and met Morgan. He befriended Morgan and saw his drawings. After Pirtle moved to Houston and took on his vocation as an artist, he showed Morgan's work to people and began selling the pictures, sending the money back to Morgan. Morgan has developed a small, devoted following. (Long time readers will know that I'm a big fan of Morgan's portraits--I used one of them on the cover of a magazine I published called Exu, which can be ordered here.) He is currently represented by the Webb Gallery in Waxahachie, Texas. They provide Morgan (who is no longer institutionalized) with high-quality art materials for his work. And Pirtle is now a well-known performance artist in Houston. Vanzant Driver started building churches out of shattered pieces of glass. (Indeed one of the things one finds with many of the artists described here is a deep, traditional religiosity. They often ascribe their work to a religious impulse.) Once he began making his churches, he brought them to various art institutions in Houston, which showed no interest. But he lucked out at the Contemporary Arts Museum when his work caught the eye of Sheila Rosenstein, director of the museum bookstore. Wehnert doesn't describe the meeting, but it seem reasonable to assume that he went to the bookstore because it was one part of the museum that is always open to the public. It's not like the director or head curators are out and available to any random person who comes in. But not surprisingly, Rosentstein was, and she had connections that made it possible for Driver's work to be seen by collectors and curators. Felix "Fox" Harris is one of those artists who takes to decorating his lawn. Like Driver, he was a visionary artist, inspired by God to create his elaborate yard art. This is one example where the "outsider" label seems false. This sculpture garden approach has a long tradition. It's known as a "yard show", and Wehnert points out that some writers suggest the tradition goes back to "Angola-Kongo influence". So while it might not be a folk art in the sense of a traditional craft passed down through practitioners over generations, it is something that continually pops up. In fact, I was surprised that Wehnert left out Cleveland Turner, the "Flower Man" of Houston who decorated his house in a similar fashion. To me, this kind of tradition suggests that "outsider art" might be a bad term, particularly for certain kinds of African-American vernacular art. I prefer the term "self-taught", but that is also inadequate fior the entire range of such art. In any case, part of the reason we know about Fox Harris is that an excellent Beaumont photographer Keith Carter stumbled across Harris's house and started recording it in photographs. 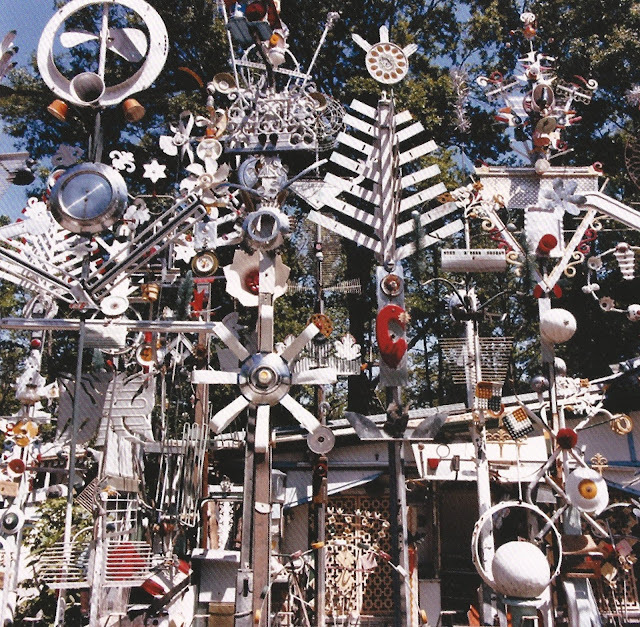 Harris's yard show was acquired by the Art Museum of Southeast Texas after Harris's death in 1985. Without the "discovery" of the work by Carter, it would probably be gone. Wehnert gets to claim his status as a "discoverer" of an outsider artist. Richard Gordon Kendall was a homeless man who drew obsessively detailed drawings of buildings in Houston that he could see from the streets where he lived. Wehnert found him through a friend who mentioned seeing a homeless man in downtown Houston, where Wehnert subsequently found him in 1995. Unfortunately, in 1998, he "disappeared"--or at least stopped hanging out at his usual haunts in downtown Houston. He was quite old at the time (68), and I doubt if living on the street was doing his health any good. So he may have died. In any case, Wehnert was never able to find out. The book rather inexplicably leaves out Cleveland Turner and Jeff McKissack, creator of the Orange Show. It may be that Wehnert felt like those artists have been discussed in detail elsewhere, but in any case, they are both prime examples of outsider artists in Texas. However, it does cover the work of eleven artists, with ample information (where it's available) about each and lovely reproductions of their artwork. This is an illuminating book.